You Can Massage Yourself A Facelift To Look Youthful. It's That Easy! You Can Massage Yourself A Facelift To Look Youthful. It’s That Easy! If you have always thought that facelift is all about getting injected with dermal fillers or undergoing cosmetic surgeries, think again! Making your wrinkled and sagging skin look taut, lifted, and youthful can be a task to practice at home. Well, it may sound surprising but regular massage can lift your facial skin to a great extent, thereby improving your overall look dramatically. All you need to do is follow the right procedure that would help you achieve the best possible results. So forget expensive procedures and facelift surgeries as we tell you here how to massage yourself a facelift. How Does Face Massage Help? Aging makes our facial muscles lose elasticity. They no longer remain toned and starts sagging, making the skin over it look thinner, more delicate, and folded. Massaging stimulates the flow of blood throughout the face, thereby allowing the muscles to release tension held there. This results in a firmer and younger-looking skin with a well-lifted appearance. It all starts with the selection of the perfect oil. You need to know the type of your skin and pick the best oil depending on that. It can be any oil of your choice (olive oil, coconut oil, sesame oil, and so on). You can also use carrier oils, such as jojoba oil, grape seed oil, etc. and add a drop or two of your favorite essential oil to it in order to make it an aromatic massage for your face. Remember to use a lighter oil in case you have oily or acne-prone skin. Adding a touch of tea tree oil to your massage oil will also help you prevent breakouts. If you want to avoid the application of oil to your face, choose a good hydrating massage cream that can address your skin issues perfectly. It is even better to opt for a herbal nourishing ingredient. A clean face is what you need to absorb the goodness of the massage oil and allow the droopy skin to restore its health. Both of these are essential for turning the skin tighter, firmer, and younger-looking. Make sure that you wash your face and hands thoroughly with a suitable mild cleanser in order to remove dirt and grime from them. Once you are done, gently pat the face with a clean towel and set to work on the slightly damp skin. As your facial skin is ready to get the treatment, it is time for yourself to get prepared. Tie your hair up and secure it with a forehead band or a bandanna so that the oil does not get into your hair. Keep the massage oil handy and preferably, sit in front of a mirror. Neck – Massage yourself from the collarbone to the chin gradually by following an upward motion. Apply alternating strokes while putting mild pressure with both of your palms. Full Face – Rub plenty of oil in between your palms and apply it all over your face. Starting from either side of your jaw, move your fingertips upwards to the sides of your mouth, edges of your nose, middle of your forehead, around your eyebrows and finally, stop when you reach the temples with the hands cupping your face. Do this 3-4 times in order to warm up all your facial muscles. Jaw Line – Place the middle and the index fingers just above and below the chin respectively. Then, move them along your jaw line in a sweeping motion as you proceed towards the ears. Cheeks – Start again with both your middle fingers placed on the chin. Move them upwards along the smile line and end the stroke at the bridge of the nose. Now, massage your cheeks in an upward motion by spreading your palms gradually from the mouth to the ears. Forehead – Place the middle and ring fingers of your right hand on the bridge of your nose. Move them gently between the eyebrows and upwards until you reach your hairline. Rub oil between your palms and then, move the right hand in a sweeping stroke from left to right and the left hand in a sweeping stroke from right to left. Repeat a couple of times. Eyes – Place the tips of the index, middle, and ring fingers of both of your hands on the starting points of your eyebrows. 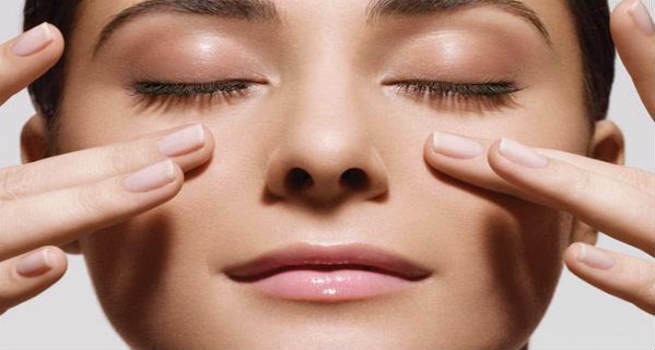 Massage along the eyebrows on both sides by following a gentle motion until you reach the temples. After that, place the ring fingers on the inner corners of your eyes and move them along the eye sockets underneath the eyes. Stop once you reach the temples. To finish off the procedure, pinch the skin gently all over the face and cover it with both of your palms so that the facial muscles become relaxed. Practicing this facial massage regularly will help you gain expertise and you would eventually be able to finish it in less than 3 minutes. So, go ahead and massage yourself a facelift that will give you youthful and glowing skin naturally. Never ever practice a facelift massage right after having a meal. When your stomach is full, the flow of blood becomes much focused on digestion. This prevents you from getting the most out of your effort.